The Ragdale Foundation, a nonprofit artist's community in Lake Forest, Illinois, has selected a design duo from Columbus, Ohio to design this year's Ragdale Ring. The temporary installation interprets the original Ragdale Ring, a theater in a garden designed by architect Howard Van Doren Shaw more than a century ago. Galo Canizares and Stephanie Sang Delgado, a project associate at DesignGroup, are calling their proposal Noodle Soup. 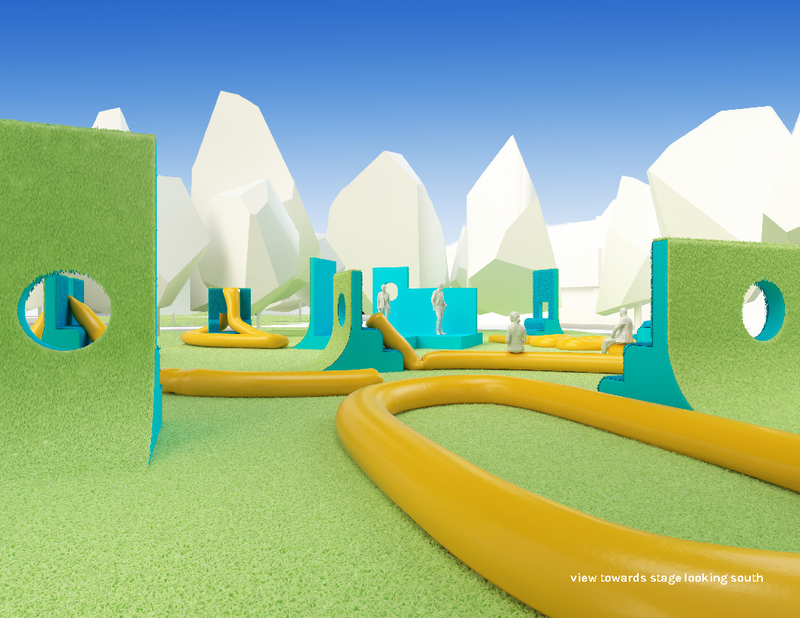 In plan, five yellow-orange squiggles are loosely dispersed between blue and green objects that seem to weave the site's grassy lawn into lounge-y areas for seated relaxation. 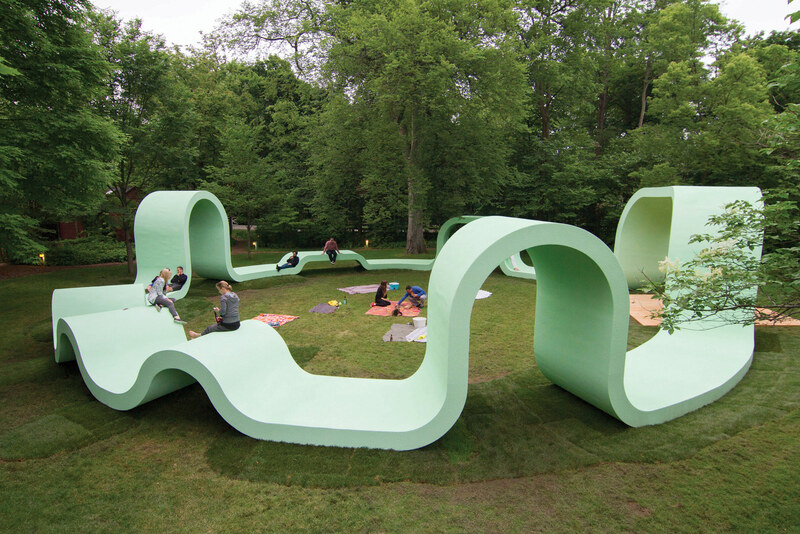 Here's what Canizares, a lecturer at the Ohio State University and founding principal of office ca, had to say about the design: "[Noodle Soup] is conceived as an interactive playscape for outdoor performances. It consists of a set of fixed structures around which are soft, linear, pliable pieces of furniture. The soft elements can interact with the hard structures to serve functional purposes such as seating, but they can also act as oversized toys, freely configurable in a variety of ways." To build their design for its June 13 opening, Canizares and Delgado will have a design-build residency at Ragdale along with a $15,000 production grant. 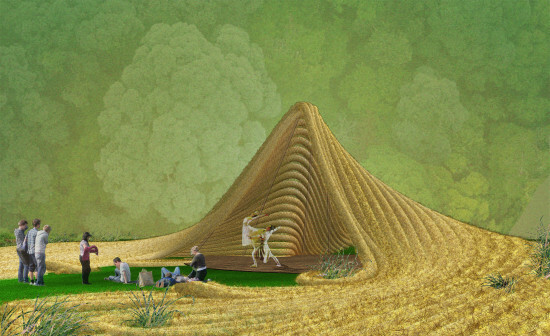 For the 2018 competition, an eight-member jury selected the duo's proposal from a pool of five finalists. The four runners-up were Wheeler Kearns's Iris, Katie MacDonald, Kyle Schumann, and Erin Pellegrino's Earthen Delight, Cyrus Penarroyo's Reflections on the Lawn, and Aleksandr Plotkin's Phantom. 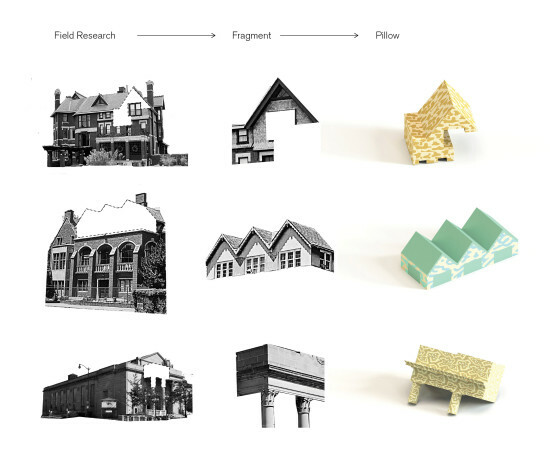 Last year, Ann Arbor, Michigan–based T+E+A+M won the Ragdale Ring competition, and this year, four of the practice's members sat on the jury. They were joined by two representatives from the Ragdale Foundation, as well as Zurich Esposito of AIA Chicago and Phil Rosborough of Rosborough Partners. Prior winners include Bittertang, SPORTS, Design With Company, and Stephen Dietrich Lee. More information about the competition, opening day, and past winners can be found here. For the past four years, Ragdale, an artist residency in Chicago’s North Shore, has asked young architects to reimagine a historic garden stage that was once a focal point of its property. In these short years, the Ragdale Ring competition, and the accompanying Adrian Smith Prize, have proven to be architecturally adventurous, and often playfully eccentric. This year’s iteration will be built by the Ann Arbor, Michigan–based T+E+A+M, a collaboration among young designers Thom Moran, Ellie Abrons, Adam Fure, and Meredith Miller. Their proposal, entitled LIVING PICTURE, superimposes images of the original 1912 Ragdale Ring onto a set of lightweight objects spread throughout the grounds. The scene of the original ring will be an immersive, if not surreal, space for the audience to become part of the theatrical setting. The varied scale of the objects also allows for the audience to position itself in relation to the stage, either sitting on or standing among the installation. The shapes, which make up the stage itself, will blend historic imagery with the lush surroundings of the property. While the imagery on the installation will mostly be seen as disparate yet related images, audience members approaching from the Ragdale House will see the entire original Ring snap into view. Watching from the other approaches, viewers will discover the scene as a series of separate vignettes of the original. “At the beginning of this year we suspended our individual practices and committed fully to T+E+A+M, but the fact that the four of us have practiced individually is one of the unique strengths of our collaboration,” Fure explained. “Each of us has different audiences through our previous work’s engagement with conversations inside and outside the discipline. 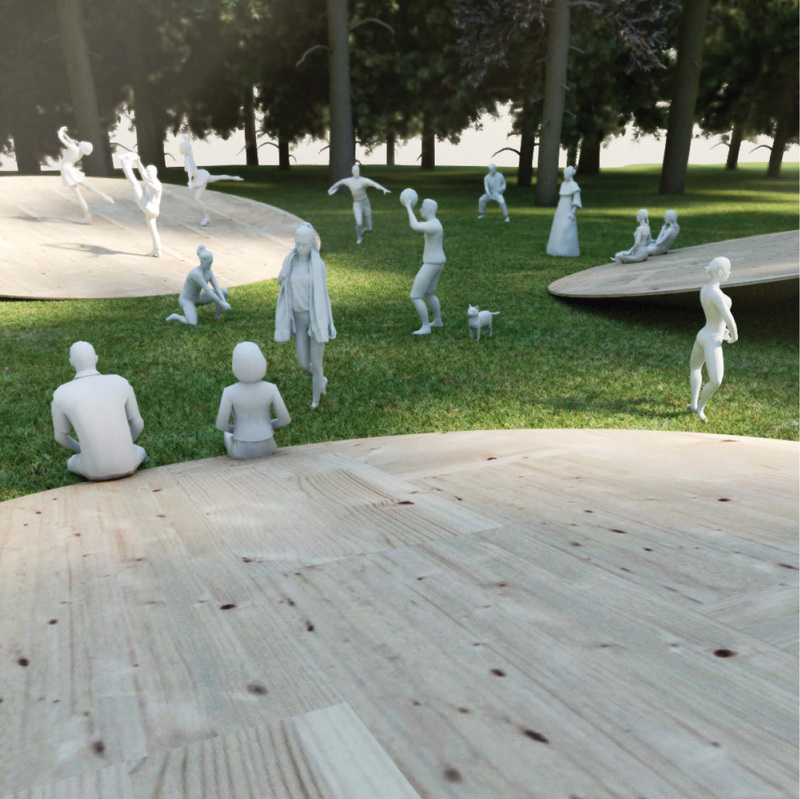 The objects will range in form, making up seating areas and platforms for performances. Arranged in seven clusters, most of the objects will also be hollow to provide storage. Their arrangement centralizes the audience while providing masked areas where performers can enter from stage-side. The project will be built in late May, to be ready for four performances starting in mid-July. T+E+A+M, along with a group of workers, will live at Ragdale for 18 days to build the installation. The Adrian Smith Prize, sponsored by Adrian Smith + Gordon Gill Architecture, provides $15,000 for the construction. The members of T+E+A+M are not strangers to exhibition and installation building. Between the four members, their work has been shown in multiple Venice biennales and at the Beijing International Art Biennale, the Shenzhen and Hong Kong Biennale, the Storefront for Art and Architecture, and the Graham Foundation, to name just a few. T+E+A+M will join the ranks of past Ragdale Ring designers SPORTS Collaborative, Bittertang, Design With Company, and Stephen Dietrich Lee. Last year’s iteration by SPORTS, entitled Rounds, won The Architect’s Newspaper’s 2016 Best of Design Award for Temporary Installation. SPORTS is a design collaboration between architects Greg Corso and Molly Hunker, both faculty at the Syracuse University School of Architecture. The Adrian Smith Prize is awarded each year to a young design firm to build the Ragdale Ring, and outdoor performance space for the 50-acre Ragdale campus north of Chicago. SPORTS will receive a $15,000 production grant and a ten person residency for up to three weeks, starting May 23. SPORTS’s design, entitled Rounds, was selected by a jury of architects and artists. 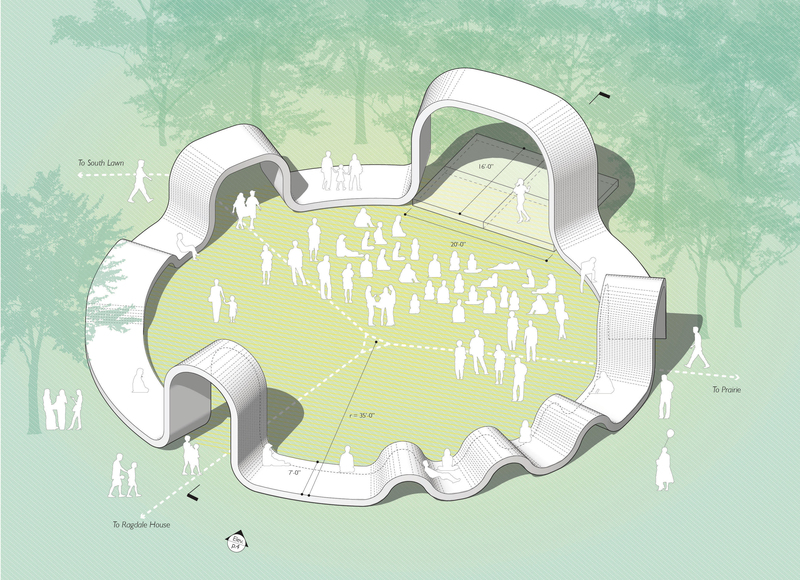 Comprised of an undulating circular ribbon, Rounds will be the site of public performance and garden party on June 9th. The rises and runs of the ribbon will act as the seating, stages, entries, and a space for the Ragdale community to gather throughout the summer. The original Ragdale Ring was designed by Howard Van Doren Shaw in 1912 as an open air theater for his playwright wife. Since 2013 Ragdale has re-imagined the Ring through an annual international competition. Ragdale specifically looks for designs that “explore intersections of architecture, sculpture, landscape, design, public art, and performance disciplines.” “I am proud to support the Ragdale Ring competition which uniquely serves the field of architecture and dynamically engages the public. Rounds is an exceptional design solution and I look forward to its successful construction and use,” remarked prize sponsor and jury member, Adrian Smith in this year’s announcement. Ragdale offers upwards of 200 residencies and fellowships annually at their campus in Lake Forest, IL, just north of Chicago. At any given time 13 artist are in residency working uninterrupted for weeks at a time. While SPORTS is in residency they will take part in nightly family style dinners, and have full access to the campuses 50 acres of prairie.